Krone round balers are built tough, taking on the harshest Australian environments with ease. From baling silage in the wettest of paddocks to baling hay in the driest of fields, Krone has three series of round balers to suit your individual needs. 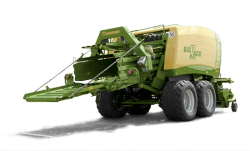 Krone square balers are renown for baling very reliable in all conditions whether its wet silage, hay and straw with impressive bale densities. The new variable Fortima and Comprima model balers, offer a more dense bale core for improved feed out of the bale. 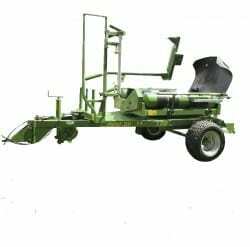 For the cleanest swaths and high quality forage, you can’t go past Krone’s Swadro rotary rakes. 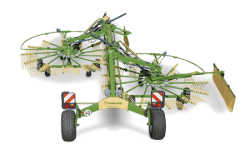 Utilising the latest innovations and technologies, Krone’s best in class rotary rakes offer high performance and reliability that you can count on. Krone Rotary Tedders use a range of innovative features to ensure a superior quality of work while maintaining operator comfort. Robust design aspects ensure downtime is minimised which is vital during harvesting. 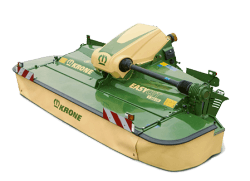 Krone Disc mowers have proven themselves in varying conditions across the world. 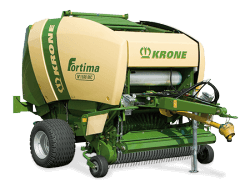 Featuring exclusive Krone innovations such as a one piece fully welded cutterbar with lifetime oil filling and quick change blades, they showcase the best in harvesting technology. 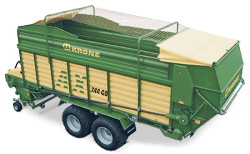 Purchasing a Krone Silage or Transport Wagon means buying into decades of forage handling experience and expertise. Professional Farmers or Contractors looking to cut costs and maximise efficiencies will find the perfect machine for their needs with a Krone wagon. The Pronar bale wrapper is easy to use. Due to the hydraulic transfer distributor, the machine is easy to operate. Self loading and unloading system shortens the time of the next wrapping cycle. The hydraulic cutting system enables the process of wrapping without leaving the tractor cab.